As a founding mother of the Kishwaukee Symphony Orchestra, Marilyn remembers rehearsals in church basements with 7-9 musicians. Occasional concerts attracted an audience of perhaps several dozen people. Now Marilyn enjoys playing in the full symphony orchestra, which gives many more concerts to large audiences. Marilyn graduated from Oberlin Conservatory of Music as a piano performance major and spent a year studying at the Mozarteum in Salzburg, Austria. Music travels have also taken her to Hawaii and Japan. 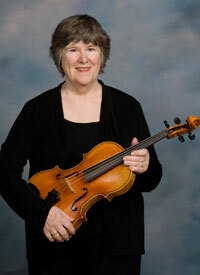 She has taught at workshops in several states and has accompanied students in recital. Activities closer to home have included Sycamore Music Boosters, Sycamore Arts Council, Stage Coach Players, Children’s Community Theater and Federated Church, where she sings in the Chancel Choir and directs the Handbell Choir. Most mornings Marilyn can be found at the Kishwaukee Family YMCA, participating in aerobics and pilates/yoga classes. Afternoons are spent teaching Suzuki Piano lessons, either at her home studio or at Northern Illinois University. Evenings often mean rehearsals or concerts. She enjoys the variety of offerings in this area, but has been known to go see one of her sons play jazz at the Green Mill in Chicago.